Follow along in this first of a six-part series as Jo-Anne Coletti takes us through every step of updating her historic 1820s home. Jo-Anne’s 1820’s home features two beautiful horse barns like this one. I have always been in awe of the beauty of older homes. With so much built-in character, they carry the fingerprints of a story from a long-ago era. 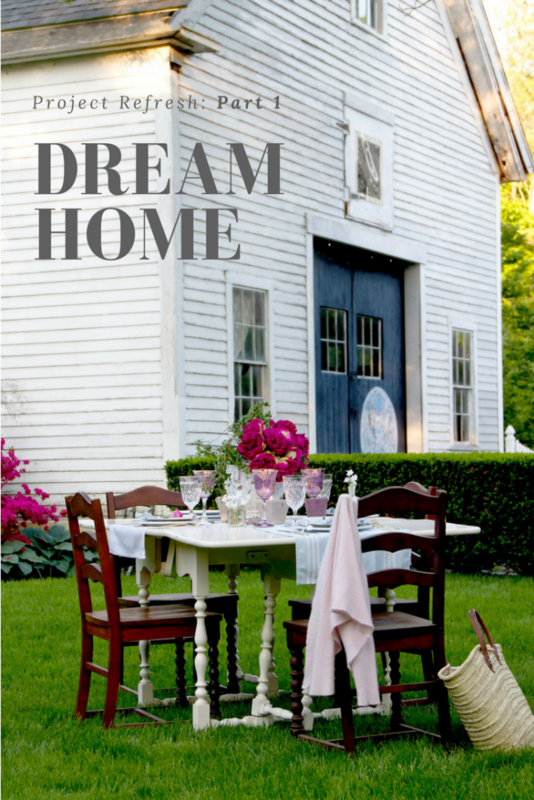 I’ve always been enamored with the idea of a stately white house with black shutters. An 1820s Federal Colonial house situated in the historical countryside of Marshfield, Massachusetts, this home had it all, including two horse barns, an English garden courtyard, five fireplaces, a secret stairway, wavy-glass windows, crown molding, authentic Indian shutters, a butler’s pantry and even a birthing room. It was like stepping back in time—and I was smitten at first sight. 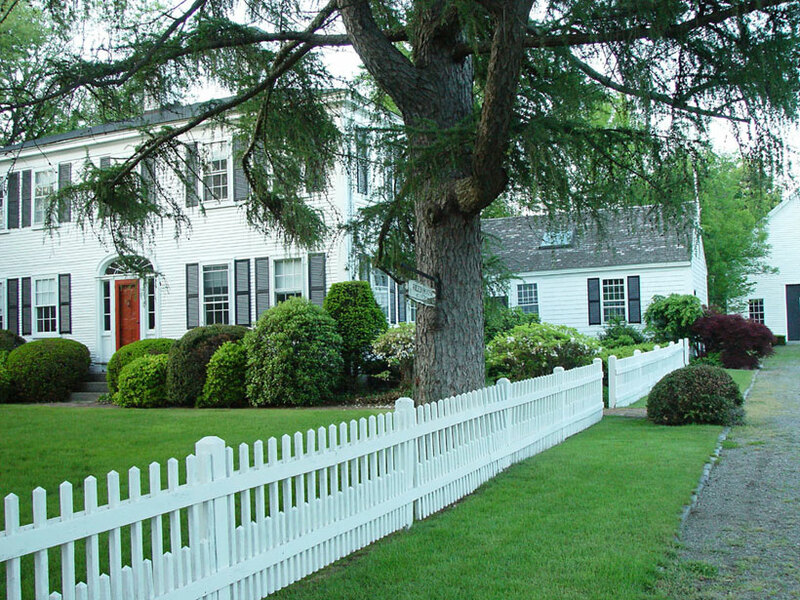 The historic home had been painted by the previous owner and already looked fresh and inviting. There was just one problem: It was out of our price range. The realtor suggested we put a bid in anyway as the house was an estate (owned by the late radio talk show host, Jerry Williams) and had been on the market for over two years—they were anxious to sell! After many negotiations back and forth, we received the exciting news that they accepted our offer. We were now the proud owners of an antique house. We were thrilled, and excited to renovate! For the exterior, the couple simply painted the front door black and changed the landscaping to fit their taste. 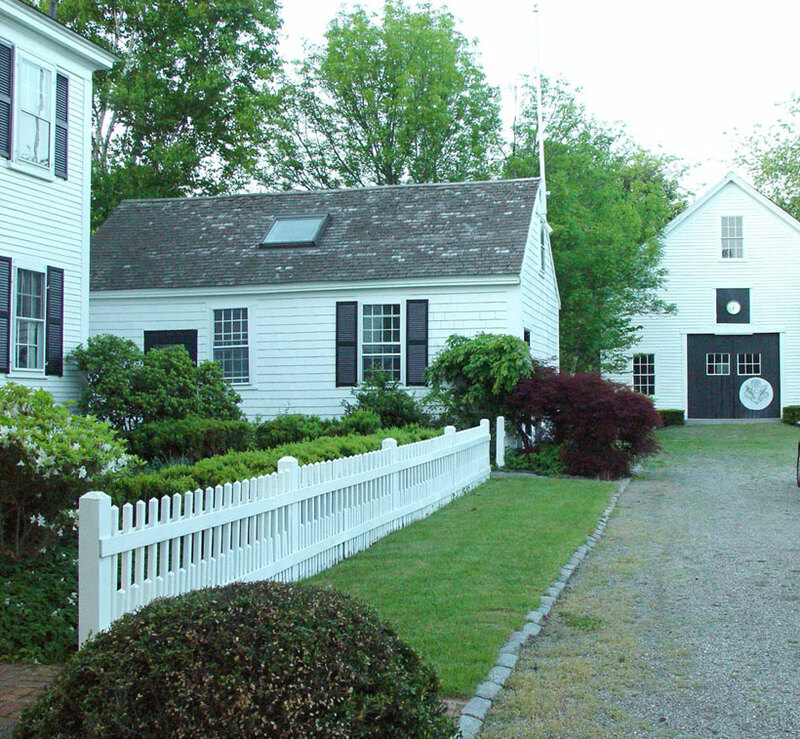 The original main house was built by Colonel Jesse Reed of Marshfield, the inventor of the first nail machine. The house was considered a mansion in its heyday (equipped with butler ring/buzzer push-buttons on the floors) and was the first house in America to be built using machine nails. Senator Daniel Webster, also from Marshfield, helped fund the home and donated two Tamarack-Larch trees for the front yard. In earlier years, one of the trees had been struck by lightning—not once but twice—in the exact same spot, yet the tree remains unaffected. 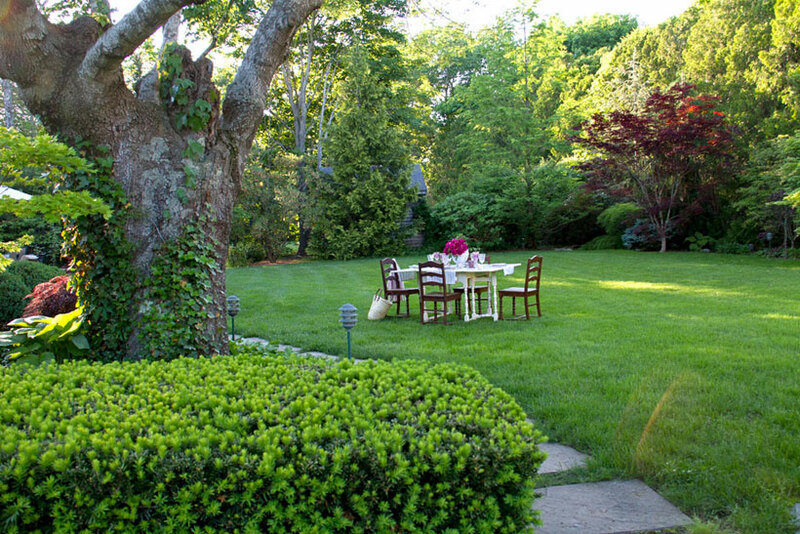 When they purchased the property, it was landscaped with overgrown shrubs and trees. 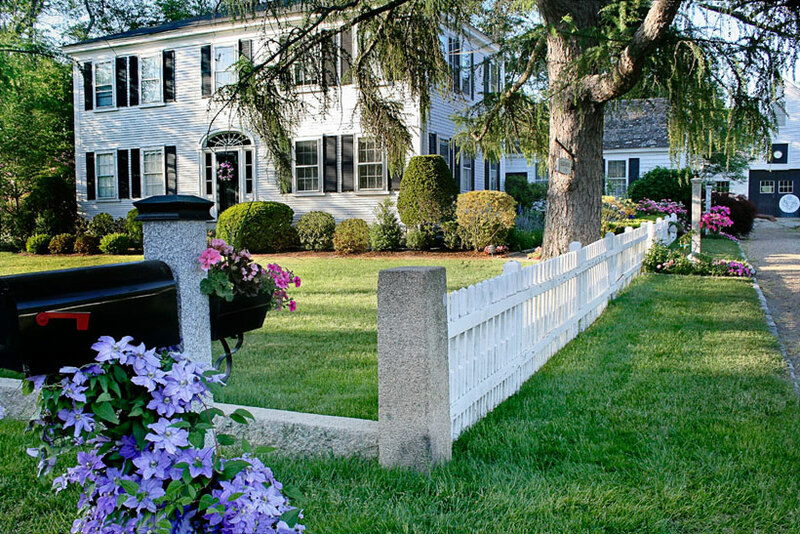 The couple decided to replace the shrubs with an assortment of flowery bushes. The exterior looked beautiful as it was, freshly painted by the previous owner. All we did was paint the existing red door a classic black. The grounds of the estate were overgrown with shrubs and small wild trees. Thankfully, we own a landscape company so we could save on materials and labor. My husband, Mark, got to work removing old shrubs and replacing them with flowery bushes in the front of the house. 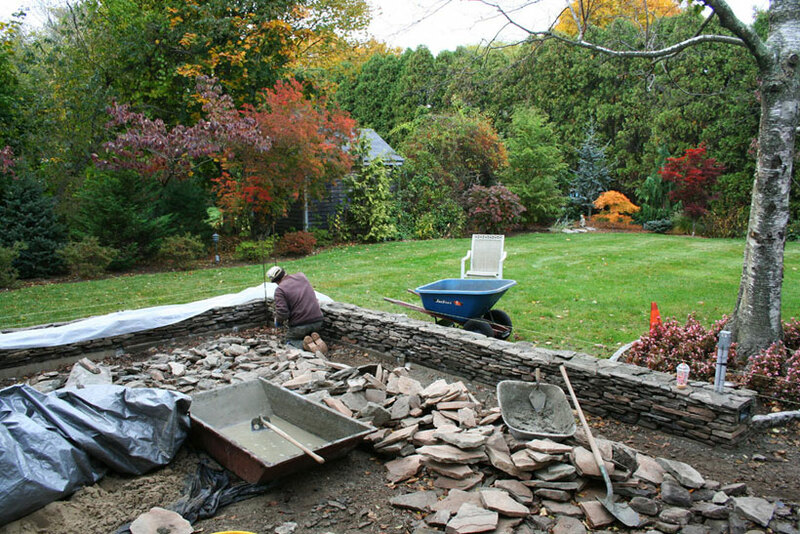 Owning a landscape business helped Jo-Anne and her husband save on some costs in the remodeling process. The courtyard was a formal knot-style English garden consisting of a border of low box hedges, ivy and Lily of the Valley. We wanted to invite more color, so we added English roses and perennials. Varieties include agastachi, white and purple cone flowers, Black-eyed Susans, penstemon, Liatris, Russian sage, phylox paniculata, shasta daisy and bee balm. 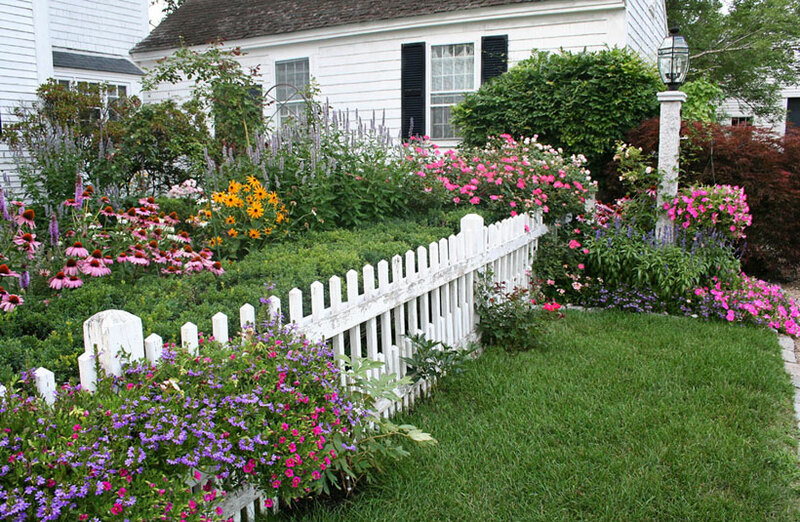 The side yard is accented with annuals such as scavoila, millions of bells, blue salvia, wave petunia and knock-out roses in many shades of pink. Details like a water fountain, bird-bath and an iron chair were added as focal points. 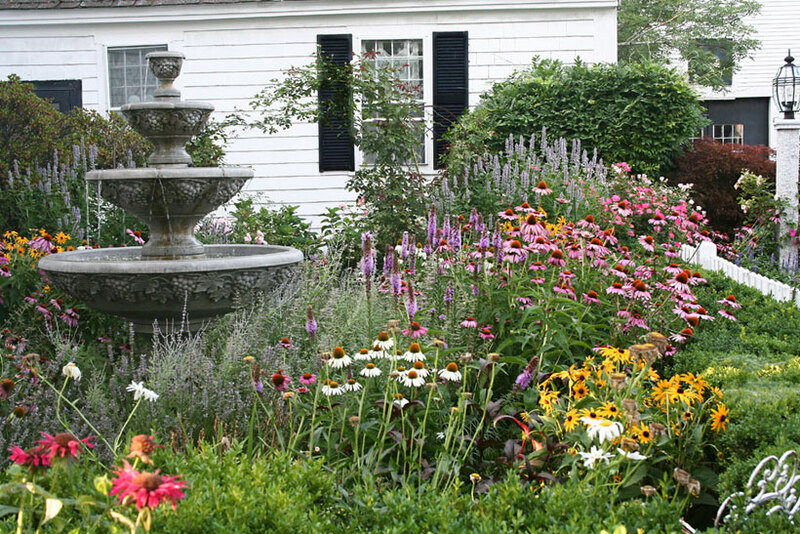 Jo-Anne added details like this fountain as a focal point in the assortment of colorful garden plants. My husband is a mad scientist when it comes to trees, and he wants specimens of every variety. In my opinion, he is an expert on scale, color and contrast when designing a garden. Every plant, flower and tree is the star of the garden, while beautifully complementing its companions. Trees bordering the landscape include Ginkgo biloba, Blue Atlas Cedar, many Japanese maples, Japanese umbrella-pine, dawn redwood, Cryptomeria, japonica, Monrovia’s Ruby Falls, redbud and Forest Pansy Redbud. 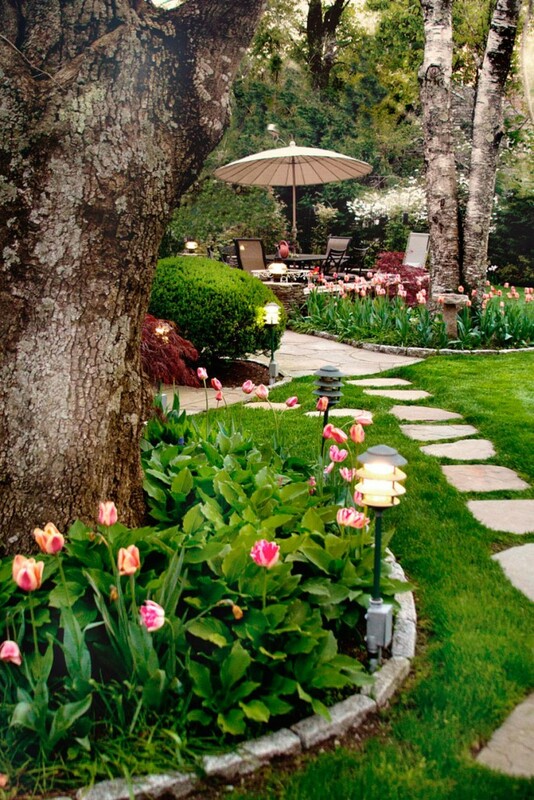 Jo-Anne’s husband carefully designed the landscaping with scale, color and contrast in mind. Anyone who owns an antique house can appreciate the nostalgic appeal, but also can understand the many challenges that go with owning a piece of history. In many ways, historic homes are a labor of love. Now, after 14 years, my husband and I have created a home that truly feels like a dream, and therse’s no other place I would rather be than living in this antique gem filled with character and history. Historic homes come with challenges, but Jo-Anne feels that she and her husband they have created a special place in their historic dream home.